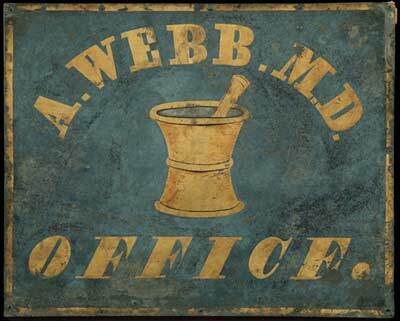 Abner Webb graduated from Cleveland Medical College in 1846 and then started a medical practice by “hanging out a shingle,” the office sign seen here (the first “webb” MD!). Almost a century later, descendants donated his carefully preserved letters, lecture notes, medical texts, and instruments to the Dittrick Museum. Curator Howard Dittrick was thrilled. He used this material to fashion a picture of early student days at Cleveland Medical College (later Case Western Reserve University School of Medicine). Dittrick wrote about Webb’s move to Cleveland, finding lodgings, and enrolling at the fledgling medical college. Tax records, non-payment of medical licensing fees, and other evidence revealed that Abner Webb, despite his training at Cleveland Medical College, failed in his bid to become a doctor and returned to farming. Ironically, the artifacts donated by the Webb family may have survived intact because Abner put them away when he abandoned the pursuit of a medical career. Molly W. Berger, “Revisiting Abner Webb, Jr., M.D. : use of alternative sources for writing the history of medicine.” Caduceus 6 (1990): 42-63.